Who else still remembers all the words to "The Bare Necessities" from "The Jungle Book"? I know I do and EVERY time I hear it, I start singing along and visualize Baloo and Mowgli dancing and singling. I love that now, my daughter is experiencing the magic of Disney movies and music. They're enduring and memorable. Disney's latest album is absolutely magical and I am obsessed. 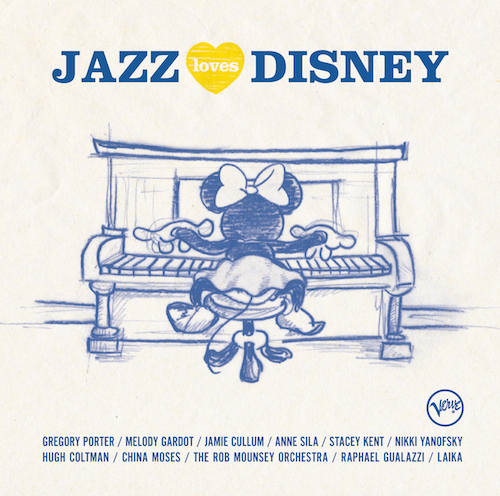 "Jazz Loves Disney" is an absolutely beautiful compilation of timeless songs. The fusion of jazz with Disney classics is a masterpiece and needs to be in any music lovers collection. The soothing voices of artists like Stacey Kent and Melody Gardot takes Disney songs to another level. Beautiful, relaxing and it's a perfect fit to pair with a lovely merlot and a quiet evening. One of the versions of the Cinderella story is the French story "Cendrillon" by Charles Perrault and with the addition of the Fairy Godmother, Pumpkin, and the glass slipper- made it the most popular version. It makes it so fitting that "Bibbidi Bobbodi Boo" is sung in French by the talented Stacey Kent. I studied French for five years and I find the language absolutely beautiful. Listen to this clip and enjoy- this is my favorite song from the entire album. If you have any trouble playing, click here to go directly to the clip. “I’ve always loved Disney films and Disney music . There’s magic about the fairytale world they conjure up. The song I chose from Cinderella captures that feeling of magical wonderment that I felt as a child. "Disney represents the imaginative representation of good and evil for both children and adults, it represents a virtual dream state.I loved the music. Favourite movie: I loved Jungle book, a lot of Jazz, soul & blues, I used to be intrigued and still am. I liked Mufasa’s voice, it was commanding, and I loved when it was time for him to spring into action and be the king of the jungle. The entire album is breathtakingly beautiful and it's one that I have listened to daily since I received my copy to review. My job is very stressful and "Jazz Loves Disney" is a perfect album to unwind to and takes me to another place. I thought EVERY single song was beautifully done and you won't be disappointed in a single cover. Ready to add Jazz Loves Disney to your music collection? Which Disney songs are your favorites?